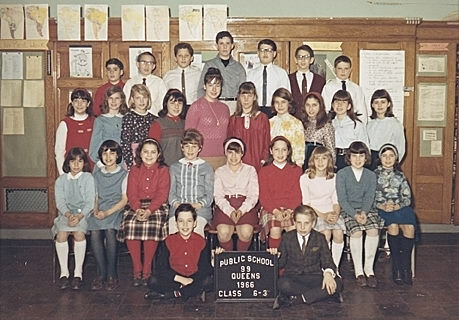 A Picture History of Kew Gardens, NY - Class Pictures - PS99 Grade 6-3 1966. Karen?, Melanie Rothstein, ?, ?, Valerie ?, ?, Phyllis Abend, ?, Carol ?, Vicky Woods. ?, ?, ?, ? , Ricky ?, Sherry Muss, Nancy ?, Susan Mayer, Rhonda Slutzky. Front - Alan ?, Arthur Berland.